Practice this quick,easy Yoga Nidra meditation twice a day. Whether at work, home or on the train or bus, this meditation will help keep you balanced through out the day and reset the busy mind so you can be more focused, effective and at ease in your daily life. For the last 25 years Kamini Desai has created unique body of teachings combining the ancient wisdom of yoga with modern psychology. Trained at Kripalu Center for Yoga and Health with degrees in Anthropology and Psychology from Smith College and La Salle University, and as daughter of one of the original yoga masters who pioneered yoga in the West, Kamini has served as Director of Wellness at Yarrow, an executive retreat center in Michigan, and on faculty of the Foxhollow Leadership Center. 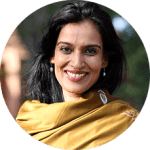 She is now the Education Director and Core Curriculum Developer of the Amrit Yoga Institute; a cutting edge teaching center for advanced studies in eastern philosophy. Could you send me this ten minute Nidra? For some reason it just starts over after the third breath – sometimes not even that far. I’m not sure if anyone else is experiencing this but this is perfect start for those new to Nidra!